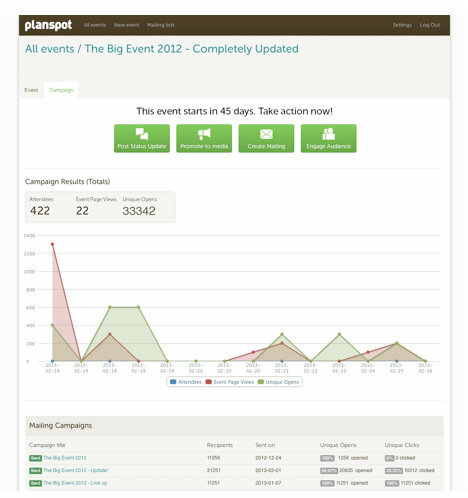 Planspot tackles this problem by creating an all-in-one event marketing tool to run integrated campaigns across social media, newsletters, magazines, newspapers and blogs, and by providing great insights in the form of powerful event analytics. Using the status update, the organizer can announce event news (like a new line-up) to its audience via Twitter and Facebook. With a single click, the organizer can promote the ticket sales link, Facebook Event and / or Planspot Event Page URL. Based on the type of event and the location, Planspot matches each event to magazines, newspapers, and event listings with an audience interested in that specific event. For example, a fashion event is matched to a fashion magazine like Vogue. However, not all channels are internationally available yet. Within the U.S., Planspot distributes events via (among others) Zvents, Allevents.in, Songkick, and Upcoming. Planspot has also partnered with well-established event promotion service GetPromotd.com, who power a media network across the entire U.S. Additionally, GetPromotd is offering online ad management and press release distribution through Planspot, so that producers can create a holistic campaign for their events. “We are constantly extending our media network and invite all media or anyone offering reach to join Planspot. We not only provide them matching events for their audience or sales leads, but also a new way of generating revenue,” says founder Satya van Heummen. The organizer can select media to promote his event and Planspot submits a professional press release. The Planspot team actively monitors whether those press releases are opened, published, or rejected. Some media promote events for free, others require payment. In all cases, it is the perfect time-saver to reach that specific audience interested in your event. Each event is automatically transformed into a professional and well-designed mailing template, saving an organizer lots of time. This mailing template includes the ticket link, the Facebook Event link, Twitter #hashtag and Planspot Event Page link. Mailings can be scheduled and sent to different mailing lists. When needed, organizers can also import and use their own templates. Planspot provides powerful statistics about the results of each mailing. 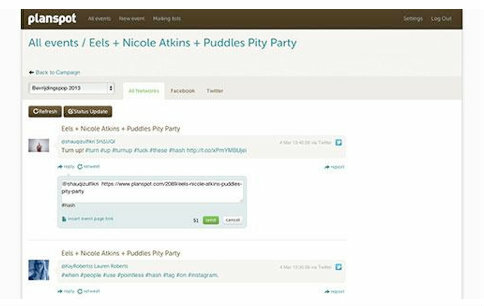 After publishing an event to social media, Planspot fetches all social media activity and displays it in a newsfeed. An organizer can engage with his audience directly from Planspot, again saving lots of time. With each reply, the organizers can again include the ticket link or event page link with 1 click. This makes it very easy to see what is being said about each event. Just select the event you want to view, see the comments, and respond to them. It’s through these 4 powerful channels that Planspot provides an integrated marketing tool for all sorts of events. The results from all channels are displayed in a dashboard with clear statistics, providing great insights about the progress of your campaign. Planspot further helps organizers by stating how many days there are left. Combined with the clear overview per event campaign, this will help organizers to steer each event towards a well-planned success. Click here for a short tour (explainer video) of the Planspot interface. The company so far has attracted nearly 750 event organizers and about 700 media partners, including well-known labels as Vogue, Elle, Esquire, and National Geographic. Planspot – founded by Satya van Heummen and run by a team of 4: van Heummen, Chris Wilson (from the social network Hyves), Michiel Scheepens (coming from ID&T) and Reinoud Tjallema – has so far raised $750,000 from angel investors. KillerStartups readers can get a 3 month, 50% discount on Planspot by signing up through this link then using the coupon code: Kllr13.